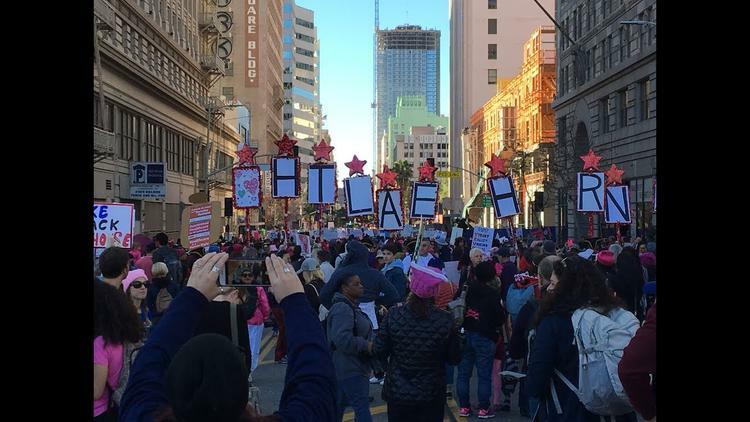 The rally in Los Angeles last year dwarfed those in most other cities. Did the City of the Angels outdo itself again this year? May Lee joined CGTN-America as the Los Angeles based correspondent in December of 2014. Since then she has already covered major breaking news stories including the hacking of Sony Pictures Entertainment and the historic California drought as well as reporting live from the Academy Awards, the Golden Globes and the record-breaking Mayweather vs. Pacquiao boxing match in Las Vegas. May also hosts Full Frame shows from Los Angeles. May has been a broadcast journalist/host for 25 years as both a U.S. based and international anchor, host and correspondent. She is the founder and CEO of Lotus Media House, a U.S. production company that launched “The May Lee Show” in 2007, the first pan-Asia talk show for the modern woman of Asia. Before starting her own media business, May was the primary anchor for CNBC Asia. She anchored “CNBC Tonight”, a two-hour, nightly business program shown around the Asian region. She also anchored business updates for “Squawk Box” on CNBC U.S. Prior to CNBC, she was with the U.S. network ABC News in New York as a national news anchor and in the Los Angeles bureau as a national correspondent. In 1999, May joined the dynamic new women’s network, Oxygen Media, founded by Oprah Winfrey. May hosted the flagship show, “Pure Oxygen”, a two-hour talk show, which covered everything from pop culture, to lifestyle, to advocacy. She also hosted a monthly, adventure travel show, “Trippin’ Out with May Lee”. May was the creator, host and executive producer of the travel program. Highlights include trekking to Mt. Everest, horseback riding in Patagonia and biking in Ireland. From 1997 to 1999, May was the primary anchor for CNN International in Hong Kong. She anchored two nightly programs as well as the weekend magazine show, “Inside Asia”. Before transferring to Hong Kong, May was the correspondent for CNN in Tokyo. CNN highlights include covering the Kobe Earthquake, Sarin Gas Attack, Hong Kong Handover and the Asian Financial Crisis. She also worked with NHK in Japan, WKEF in Dayton, Ohio and KPIX in San Francisco, California where she first began her broadcast television career. May authored the book, “May Lee, Live and in Person. It all begins with Passion” published by John Wiley & Sons. A Korean version of the book was published by Random House Korea.